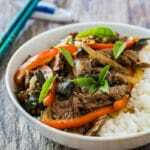 A savory and sweet Asian stir-fry which is easy and delicious. 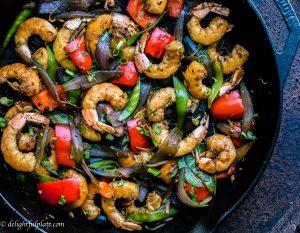 Featuring shrimps and lots of healthy vegetables. Serve it hot with rice! Stir-frying is an important cooking technique in Vietnam. Even today, not many households have an oven so for most families, the only way to cook food is on stove-top. That explains why we make stir-fry regularly, for both daily meals and special occasions. We always have a vegetable medley stir-fry dish in special occasion meals, especially in death anniversary meals. Death anniversary is an occasion when members of an extended family gather in honor of a deceased family member. We burn incense sticks for the deceased person and prepare a banquet with traditional foods including vegetable medley stir-fry. Some of the other dishes are boiled chicken, fried spring rolls, and steamed sticky rice. 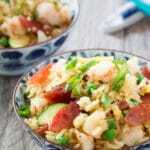 This stir fry features shrimp and crisp veggies, which are red bell peppers, snow peas and mung bean sprouts. First, we need to stir fry the veggies quickly. Next, brown the shrimps and then add the veggies back to the pan. Finally, add the sauce and stir well to coat all ingredients with it. 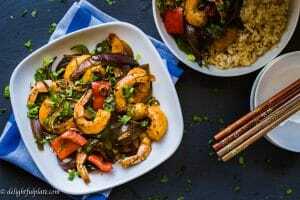 That’s all the steps you need to do for this savory and sweet Asian shrimp and veggies stir-fry. You can use any proteins you like in stir-fry. Beef, pork, chicken, shrimp or squid, pick whatever your heart desires. Some other vegetables suitable for stir frying are broccoli, kohlrabi, cauliflower, green bean and zucchini. 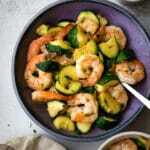 I also have a recipe for Sautéed shrimp and zucchini. 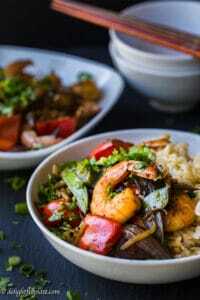 A savory and sweet Asian stir-fry which is easy and delicious. Serve it with hot rice. Peel and devein the shrimps. Mixed with 1/8 teaspoon of salt and black pepper. Cut onion into thin wedges. Slice snow peas into 0.5'' thick strips (you can skip this if your snow peas are small enough). Cut red bell pepper into 1'' x 1'' pieces. Put a pan/skillet over medium - medium high heat. When it's hot, add some oil and red onion. Sauté onion until fragrant, about 2 minutes. Add red bell pepper and snow peas to the pan, stir-fry for about 2 minutes. 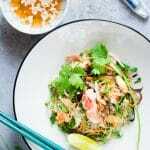 Add mung bean sprouts, 1/8 teaspoon of salt, black pepper and stir-fry for about 1 minute or just until all veggies are 80-90% cooked. Transfer to a plate. 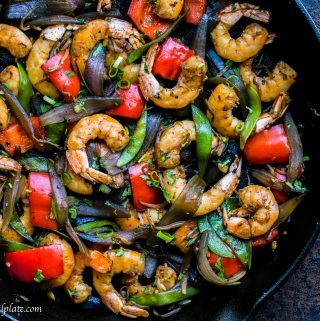 Make sure the pan is hot, add some oil and shrimps. Brown the shrimps for 1-2 minutes. Add garlic and add all veggies back to the pan. Add oyster sauce, soy sauce and fish sauce and stir to coat everything well in sauces. Stir fry until all ingredients are cooked through. Garnish with scallion and cilantro. Serve hot with rice.